Well, this will be too late to preempt the NL and AL Comeback Player of the Year awards. If you're interested, you can read my pick for the American league here. The NL award went to the Phillies' Brad Lidge, who went 41-for-41 in Save opportunities while posting a 1.95 ERA in 69 innings. This came a year after blowing 8 Saves in 27 chances with the Astros last year, so it's seen as a major turnaround, I guess. I disagree. I think Lidge's real turnaround was from 2006 to 2007. He went 1-5 with a 5.28 ERA that year, even though he did save 32 games. Christian Guzman, who hit .316 in 579 ABs after playing only 46 games last year, or Jorge Cantu would have been better choices. Cantu hit .277/29/95 with 41 doubles and 92 Runs after hitting a combined .252 with one homer in 52 games for Tampa and Cincy in 2007. Now that's a comeback! Ryan Dempster would have been a better choice, too, for going 17-6 with a 2.96 ERA in 200+ IP after several years of relieving, and not always well. Cantu would have been my pick, though. How do I lead thee? Let me count the ways. My bat can reach, to hit balls out of sight! I lead thee in Runs Created, Times on Base. I lead in OPS, by sun and candle-light. In Batting Wins, though by threads my elbow's hanging. I lead thee in WARP, the best I've ever done. I shall but lead next year in everything. Albert Pujols is, far and away, the best player in the National League, and it's not even close. Besides the stuff I could rhyme, he alse led the league in EqA, RC/27 Outs, BB/AB, K/W, Fielding Percentage, Range Factor, Zone Rating, RZR and Double Plays Turned (for his position). In case you were wondering. Discussions of Ryan Howard (because he leads in Homers and RBI) are laughable. The man also made 475 Outs, more than all but half a dozen men in the Senior Circuit. Chipper Jones was nearly as good as Pujols, with the bat if not the glove, but he played 20 fewer games. David Wright and Lance Berkman both had great years, but they're on a whole different plane from Pujols. Nobody else is even worth discussing, and for that matter, neither are these guys, but somebody's going to ask, so I figured I'd get this out of the way. There are three main candidates for this award: Tim Lincecum, Johan Santana and Brandon Webb. Santana leads the NL in innings pitched (by 7 over Cole Hamels) and ERA (by 0.09 over Lincecum). 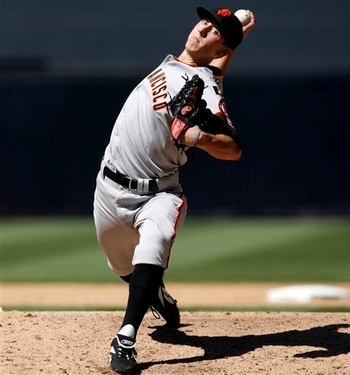 Lincecum leads in strikeouts, by 59(!) over Santana and Edinson Volquez, as well as Adjusted ERA (164 to 163 over Santana), K/9IP, and Hits/9IP. Also Wild Pitches, which admittedly does not help his case, but I thought I should mention it. He should lead in winning percentage, too, but they don't count innings for that, just decisions, so his 18-5 record is just barely edged out by Adam Wainright's 11-3, even though he tossed only 132 innings. Amazingly, C.C. Sabathia tossed 130 innings and went 11-2, but he's not listed there, so I guess the cutoff is 14 decisions. Sabathia, despite pitching only half the season in the NL, leads it in complete games (7) and shutouts (3 - tied with Ben Sheets). He also leads the majors with 253 innings, though he can't lead either league. There's been some talk of C.C. getting the award, like Rick Sutcliffe did in 1984 when he was traded to the Cubs in mid season and won 16 games for them, but he went 16-1 in 150 innings, much gaudier than 11-2. And besides, that was an awful decision. Rick Rhoden and Dwight Gooden were both much more valuable than Sutcliffe had been that year. So were Rick Mahler and Larry McWilliams, for that matter. Let's not repeat the mistake. Webb leads in Wins, with 22, four more than Lincecum, his next closest rival. Sadly, many of the BBWAA voters still pay too much attention to this stat. There's just no precedent for a guy leading the league with 20+ wins, without anyone else close to him, and not winning the CYA, unless it goes to a reliever or something, and, with all due respect to Brad Lidge, there's nobody in the NL who's a viable candidate for that. Bartolo Colon won it in 2005 with a 21-8 record, despite the fact that it was a demonstrably inferior performance to that of Johan Santana, who went 16-7, just like this year. Roger Clemens over Roy Oswalt in 2004 isn't quite the same, as there was only a 2-win difference, plus a 6-Loss difference. Webb's 22-7 looks a lot better than 20-10. My vote would be for Lincecum, partially because in allowing fewer hits and striking out more batters, he did a lot more of his own laundry than Santana, but Santana would hardly be an undeserving candidate. If a precedent can be set to give the award to the best pitcher instead of the guy with the most W's next to his name, this is the year. My guess is that Webb wins his second CYA by a nose. There are quite a few candidates for this one, too. Cubs' catcher Geovany Soto is the most likely candidate, a rookie catcher who helped the team to the playoffs, hitting 23 homers and driving in 86 while playing impressive defense. He finished the season with an NL-rookie-leading 39.4 VORP and 7.0 WARP. The Reds' Joey Votto is the only other hitter in the discussion, as he led the NL rookie field in all four of the 3-digit stats, AVG, OBP, SLG, and OPS, hitting .297/.368/.506/.874 with 24 homers, which also led all rookies. He also led in games played (151) hits, and at-bats. His 6.6 WARP was pretty close to Soto's, as was his 34 VORP. Atlanta's pitcher Jair Jurrjens deserves some mention, as his 188 IP, 13 Wins and 3.68 ERA led all NL rookies. Hiroki Kuroda was nearly as good, but won't get much attention because of his modest 9-10 record. No other rookie won more than 9 games or saved more than 7, so there's really nobody else to discuss. My vote would be Soto, Votto, Jurrjens, in that order, and I suspect that for once the BBWAA will agree with me.